Our friends at Progresso have drastically reduced the cooking time on New England Clam Chowder, but we don't have time to stand around stirring the pot for hours. (Or four minutes. We also don't have time to read directions.) 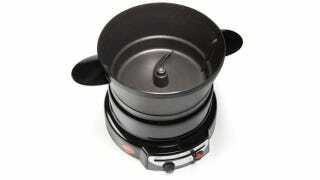 That's why we're investing $99.95 in Hammacher Schlemmer's new self-stirring pot. Between this and the electric can opener, it won't be long before a robot maid is cooking our food for us. We're this close, people!